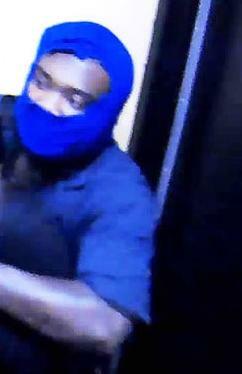 The FBI Violent Crimes Task Force needs your help to identify the man who robbed a Houston bank on October 14. At approximately 6:55 a.m., a man armed with a sawed-off shotgun entered the Wells Fargo Bank branch located at 12894 North Freeway in Houston, Texas. After receiving an undisclosed amount of cash, the robber fled on foot and eventually entered a black Mazda 626 with an unidentified person driving. A man investigators believe acted as a lookout during the robbery was taken into custody and is now charged with bank robbery in Harris County. No one was physically hurt. The armed robber is described as a black male, approximately 5’6” to 5’7” tall, with a medium build. He wore a blue one-piece jumpsuit, blue beanie pulled over face with eyes and some face exposed, and maroon Adidas shoes with white stripes. Crime Stoppers is offering up to $5,000 for information leading to the charging and arrest of this robber, or any felony suspect. If you have information about this crime, please call the Crime Stoppers tip line at 713-222-TIPS (8477) or the Houston FBI office at 713-693-5000.